The newest ones are on their own special page. Have you checked out our Testimonial pages lately? We are always happy to hear the amazing ways our Tallow Balm and Deodorant Tallow Balm have helped people! We compile and categorize the testimonials from what you send us plus what you post on individual products on our website, on Amazon.com, and on Facebook. "This is the best skin product I have ever used, and I've used plenty. I've been a Wellness Coach, Herbalist, and Yoga teacher all my adult life and gradually became so disappointed in everything available for skin care that I just made my own. I used all the best organic oils, plus essential oils and aloe vera. They were good but either disappeared too soon, leaving my skin thirsty and dry, or they sat on the surface of my skin too much. At some point, I switched to emu oil, which was an improvement, but still not perfect. 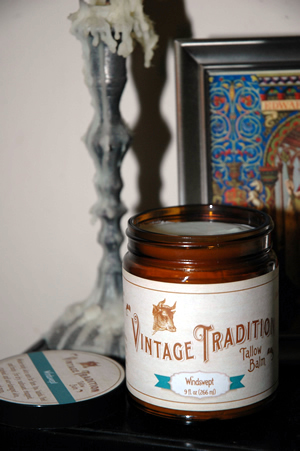 As soon as I discovered Vintage Tradition Tallow Balm, I immediately ordered some and was beyond thrilled over the concept, quality, and results. I put a little in my palm and gently rub my hands together to warm and soften. Then it goes on my face, legs, feet and hands. Twelve hours later, my skin is still moist and soft; itching dry skin on my legs is a thing of the past; dry heels are now healthy and pink. Thank you SO much, Vintage Tradition!" For true skin health, order "The Whole Food of Skin Care" and create your own story! Please be sure to post your story on our website and on Facebook. Thanks from your friends at Vintage Tradition!